Two loose-leaf hinged pages, plastic coated and washable. Port sized to hold average coin securely and covered with acetate slides to protect both sides of coin. Ports are imprinted to properly identify coins. 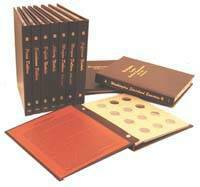 Pages are housed in a two-post simulated leather binder and beautifully Gold Stamped.